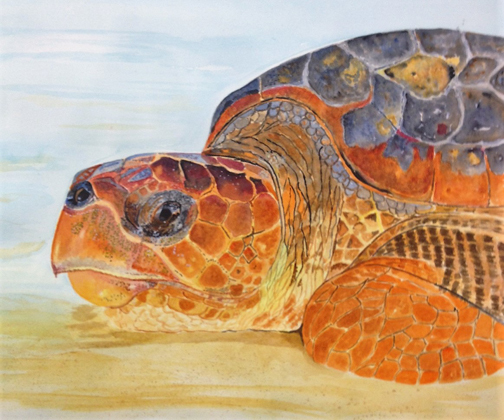 FLAGLER BEACH, FL – Sea turtle nesting season ends October 31 and Ocean Art Gallery is celebrating sea turtles the entire month of October with an art gala, art raffles, and an update about nest hatching results. All of this will take place during what gallery owner Frank Gromling calls a “Turtle Palooza!” All events will take place at the gallery’s 206 Moody Blvd. (SR 100) location in downtown Flagler Beach. Partnering with the management and staff of Gamble Rogers Memorial State Recreation Area, commonly known as Gamble Rogers State Park, and their community service organization the Friends of Gamble Rogers (FROGRS), Gromling has planned a multi-event month to benefit FROGRS, a 501.C.3 non-profit group. The gallery will start the activities on October 6 with a gala art gathering from 5 – 8 pm with the showing of sea turtle art by nine artists, accompanied by live music, light refreshments and fun. This gala coincides with Flagler Beach’s “First Friday” music event at Veterans Park across from the gallery. All during October the gallery and FROGRS will sell raffle tickets for “Coming Home,” a giclée by acrylic artist Fred Haase, and “Golden Girl,” an original by watercolor artist Bibi Gromling. All proceeds from raffle ticket sales will go to FROGRS. The raffle drawings will be at 6:45 pm on October 27 during the Art Gala Finale. The Finale will feature an end of season sea turtle nesting report by a Gamble Rogers park ranger on the number of nests and hatchlings, plus a continuous showing of sea turtle pictures on a large screen television. Light refreshments will be served during the 5 – 8 pm gala. Artists whose sea turtle art will be featured all month during “Turtle Palooza!” include Rick Cannizzaro (acrylic), Glenda Greenberg (sterling silver jewelry), Bibi Gromling (watercolor), Fred Haase (acrylic), Art LaMay (watercolor), Lorraine Millspaugh (acrylic), Kelly Quinn (acrylic), Scott Schnell (sculpture), and Clay Williams (sculpture). The gallery will donate 10% of all sea turtle art sales during October to FROGRS in support of the volunteers’ important activities at the park. Raffle tickets are available for purchase at both Ocean Art Gallery and Gamble Rogers State Park from September 22 until 6:30 pm on October 27. Tickets are $10 each or 3 for $25 for Haase’s “Coming Home” valued at $1000 and $5 each or 3 for $10 for Gromling’s “Golden Girl” valued at $375. All proceeds go to FROGRS. For more information, call Ocean Art Gallery at 386.693.4882 or Gamble Rogers State Park at 386.517.2086.